There are two ways to add a vehicle to the system. The first way is to add them in one at a time. You can find how to do add each of them at a time here. The second is to import vehicles in bulk which you can find how to do in these steps below. You can also watch the video below to gain a better understanding. 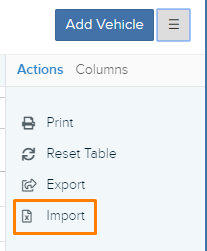 Where do I find the button to import vehicles? 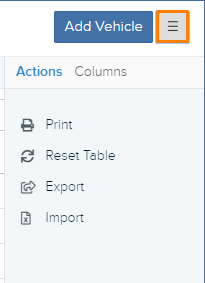 You will notice that the excel sheets have several columns for you to fill up. The columns that you will have to fill up is the Vehicle Make, Vehicle Model, Vehicle Class, VIN, License Plate and Vehicle Type. The mandatory column that you will have to fill up is Vehicle Class as it important for your rates. You can learn more about vehicle classes here. You can hover your mouse over the small red triangle on the top right of each column to know more about the columns. Once you have finished entering your vehicles into the Excel file, save the file.